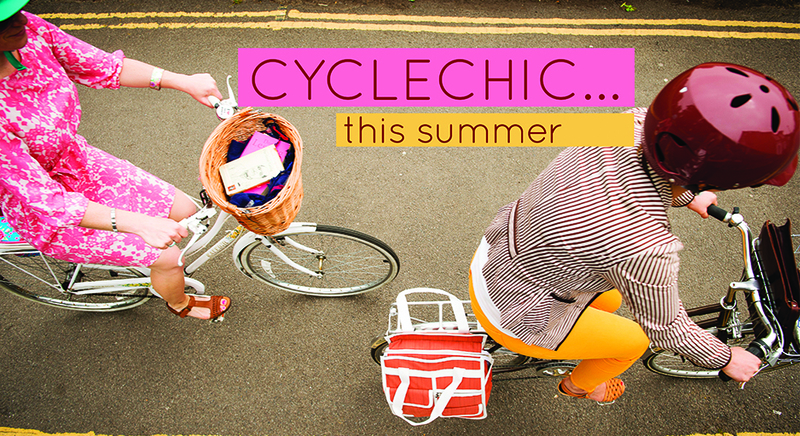 When I launched Vélo Vogue in 2008, I was incredibly inspired by the Cycle Chic movement. It was a brand new way of not only perceiving how a person chooses to get from point A to point B, but more importantly, it was a way to connect with kindred two-wheeled spirits all over the world, from Canada to Brazil, to England to South Africa and more. Vélo Vogue has opened many doors and showed me new paths, and for that, I am eternally grateful. But now in 2015, our bike culture has evolved. We've entered into a new dialogue. We talk less about what we wear while we're biking, and more about a new world order, where our very existence on this planet is challenged by climate change, where capitalism has prioritized profit over people, and all other life forms become collateral damage. Where women and people of color still cannot feel safe in public places. We live in a world that is unacceptable. The bicycle, as someone I know once said, is quite literally a vehicle of change. So it's up to us bike people to help create a new world. And by us, I mean YOU and ME. So here's what I'm doing. Thanks to Vélo Vogue, I have been inspired by people worldwide whom I've met through our online global bicycle community. And since I'm a filmmaker, I decided the best way that I can contribute to the shift towards livable cities--and a livable planet--was to use film to tell the stories of the people I've met: exceptional individuals who made a choice to opt out of fossil fuels and opt in to pedal power. So from here forward, my gift to you is Velo Visionaries. 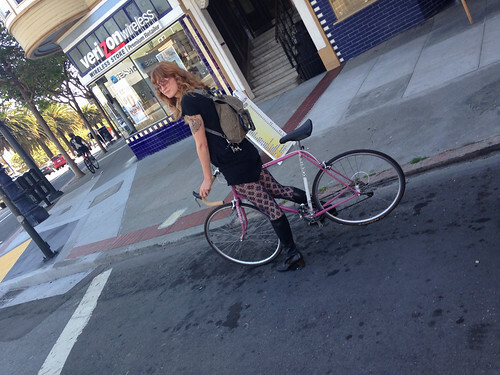 Episode 1: Chris Carlsson is one of the original co-founders of San Francisco's Critical Mass. He also co-founded Shaping San Francisco, a participatory community history project documenting and archiving overlooked stories and memories of San Francisco. Chris is the author of three books, "Nowtopia," "Vanished Waters: A History of San Francisco's Mission Bay," and "After the Deluge." Episode 2: Morgan Fitzgibbons is the co-founder the Wigg Party, [freespace], the Urban Eating League and the NOW! Festival. He is also an adjunct professor of Environmental Studies at the University of San Francisco and he holds a Masters degree in Philosophy, Cosmology, and Consciousness from the California Institute of Integral Studies. Through this ongoing series, you can perceive the world through the eyes of some very inspirational people through a fresh, new lens, and ride along with them on their favorite paths in San Francisco and beyond. I won't be posting on the blog anymore, but if you want to continue to follow my work, please subscribe to the Velo Visionaries Vimeo Channel or YouTube Channel. You can also still find me in the same old place on Facebook and Twitter where I post about issues concerning bike culture. So that's what I am doing to change the world for the better. What about YOU? Be inspired. Be the change. Ride on. Enjoy the new music! Love this artist and love her even more on a bike wearing a sparkly outfit! Chris Bruntlett, blogger, writer, bike advocate from Vancouver, B.C. has some insight regarding the effectiveness of a mandatory helmet law for cyclists, as is currently proposed in California. We can learn from the failure of this law in Vancouver. This article first appeared in Hush Magazine on August 7, 2012. Please note: statistics cited may be outdated. Bike-share systems are another area where mandatory helmet laws become extremely problematic. Since the Vélib’ launched in Paris five years ago, the City of Vancouver has been studying the idea of a bike-share of our own. The lengthy delay has been down to one factor: how do you force people to wear helmets for a spontaneous, short trip on a shared bicycle? Meanwhile, over 300 cities around the world have passed us by, including such cycling hotbeds as Omaha, Houston, and Kansas City. Only three have attempted to do so under a helmet law: Melbourne, Brisbane, and Auckland, all of which were colossal failures. Vancouver tentatively plans to launch a system in spring of 2013, which will be significantly smaller than its Montreal and Toronto counterparts, and (laughably) includes helmet-dispensing and sanitizing machines. All of this notwithstanding the fact bike-share programs have proven to be incredibly safe; London, with far fewer traffic-calmed streets than Vancouver, hasn’t experienced a single serious injury after 4.5 million trips. 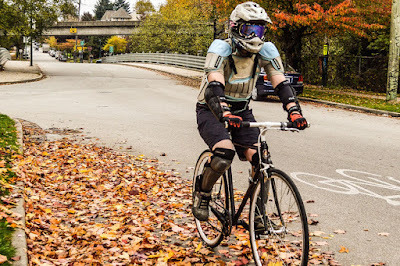 However, there is a small but growing number of local activists who are speaking out against the law, calling themselves “The Church of Sit-Up Cycling” (in reference to one exemption from the BC helmet law: “conflict with an essential religious practice”) and launching a call to action: http://www.helmetchoice.ca. I stand proudly with the “Church”: the adult helmet law is a direct contradiction to our city’s goal of becoming the “World’s Greenest” in eight short years. It’s time to abandon the idea of helmet regulation, and try something new: increasing cycling safety through numbers and infrastructure, as they do in Copenhagen, Amsterdam, Tokyo, Montreal, and New York City. Then, and only then, will the bicycle stand a chance of becoming a viable and widely accepted mode of transportation in Vancouver. I, for one, can’t wait. All photos and words by Chris Bruntlett, unless otherwise noted. Dear Senator, I'm Pro-Choice and I Vote! Let's talk about safety. I ride a bike everyday in San Francisco. Mostly I ride without a helmet. When I go on a long bike ride, or bust out my road bike with skinny wheels and clipless pedals, I'll often don a helmet because I might be riding at faster speeds, or in windy conditions where the bike might fall over with me on it, without enough time for me to put my foot down and get my balance. But when I ride my everyday-bike to get from point A to point B, like commuting or running errands or meeting friends, the only headgear I'll wear is a warm hat, or my Giants cap if I'm going to a game. I do this for three reasons. First of all, I ride really slowly, in control of myself and my surroundings at all time. I ride slowly enough to avoid potholes. I'm a defensive rider so I anticipate the behavior of drivers and avoid them. Secondly, I am making a social statement. I'm telling the world out there that riding a bike is not dangerous. It's safe, especially when there are more people on bikes on the road. So when a driver yells at me from the car window that I need a helmet, I usually tell them that they actually need one because you're far more likely to get injured or die in a car than on a bike. This leads me to my third point: I'm making a political statement. Our lawmakers must realize that it's not bike helmet laws that we need, but bike infrastructure, and lots of it. In our cities, in our suburbs, across the whole state of California, across the entire nation, continent, hemisphere, world. Cities like Copenhagen understand this. When I was visiting in November, what was in abundance was a connected network of separated bike lanes that were used rain or shine by all types of riders of all ages, genders and classes. It felt as safe as safe can be, whatever hour of the day, even during commute hour. Street traffic flowed seamlessly, and not once did I encounter an altercation between a cyclist, a pedestrian and a motorized vehicle. Everyone had a place on the road. We coexisted in an urban harmony. And just when it seemed that the conditions for cyclists in California were beginning to improve, when more people are choosing a bike as their primary means of transportation in urban environments, Senator Carol Liu throws a wrench in our spokes: SB 192 would make it mandatory for all Californians of all ages to wear a helmet while riding a bicycle. And The Great Helmet Debate begins once again. Pro-Helmet people will tell you that helmets save lives and protect your brain from injury. 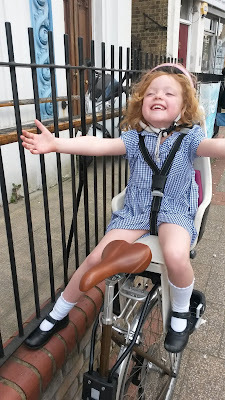 Pro-Choice people will tell you that wearing a helmet does little to nothing to make cycling safer on our streets. Lawmakers are not scrutinizing the real issue - WE NEED SAFER STREETS. And by safer streets, I mean we need BICYCLE INFRASTRUCTURE on our streets, including protected bike lanes, bicycle traffic lights, bike boxes, and more. Cars have infrastructure. Pedestrians have infrastructure. 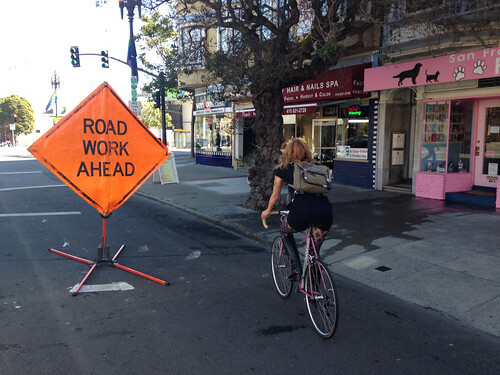 Bicyclists need infrastructure too. And bicycle infrastructure, just like the helmetless riders in Copenhagen will tell you, will protect you much more than a piece of plastic on your head. The true problem is that California is a car-centric culture. The entire state was built in a way that favors car transportation. Even in places like Davis, Berkeley, Palo Alto and Long Beach, where bike infrastructure is pretty good, we still have a long way to go to make all types of cyclists feel safe enough to use bikes as an everyday transportation choice. Being Pro-Choice is not being Anti-Helmet. I'm not saying you shouldn't wear a helmet. Do it if you feel safer wearing one on your bicycle, but don't make me or other Californians who don't want to wear a helmet wear one. A Pro-Choice California would turn the discussion back to the root of the issue - real bicycle safety through real bicycle infrastructure. Please read this fantastic list of facts about SB 192 presented by the California Bicycle Coalition. And when you're done reading the facts, please sign their petition to stop SB 192. Tomorrow I will post an article from Chris Bruntlett, bike-advocate and one of the masterminds behind Modacity. Here's a pic I took of Chris and his daughter Coralie. Chris lives in Vancouver, British Columbia, a city with a mandatory helmet law. Chris will tell you why the helmet law isn't working in Vancouver and why California shouldn't adopt it. STAY TUNED! My friend and "fellow" female film director/bike gal Laura Lukitsch has published a new webisode of her ongoing bike tips series on Youtube. This one is called "Outsmarting the Bicycle Thief." The film runs down all the do's and don'ts of locking up your bike, on the streets and in your garage. I see a lot of bikes that are locked up carelessly in San Francisco, and I hope everyone watches this fun short film to gain some valuable insight to keep your valuable ride safe and sound. 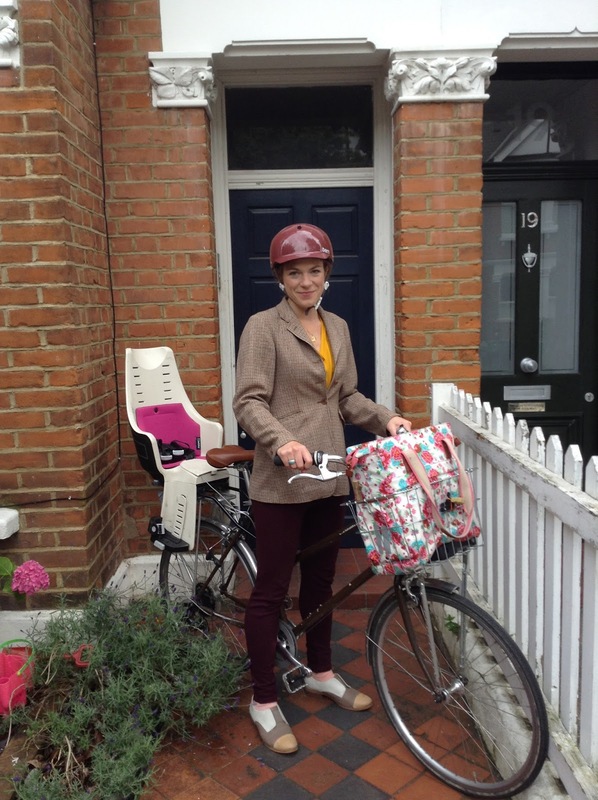 Last week I launched the latest of my Tips for Urban Biking Series where I am covering ten questions or roadblocks for people new to urban cycling. I started the series because five years ago, when I was first contemplating but fearing urban cycling, the majority of the cycling videos on YouTube were either of bikers doing stunts, riding messenger style, or talking about something technical. I didn’t intentionally set out to create my series for women, but looking at viewership statistics now, I’m surprised that upwards of 90% of the audience is men. I thought being a woman director and casting a wide variety of non-technical riders, I’d get a larger female audience. I would love for my web series to reach more women who have chosen the bicycle as their main form of transportation. The latest episode looks at tips and techniques for keeping your bike safe in the urban environment. Although this topic has been covered in numerous videos, Outsmarting the Bicycle Thief features a diverse cast of characters, including an Asian actress in the role of "The Thief." I hope you enjoy my perspective on this issue. Also, I’ve included tips on a frequently overlooked aspect of parking: where you park and lock your bike. More and more bikes are being stolen from garages and back yards, and we need to be aware of how to ensure our bikes remain safe. 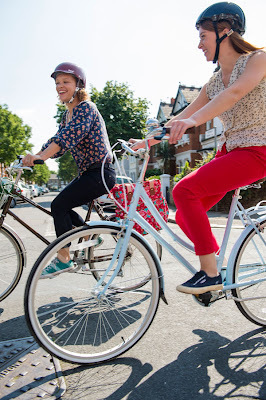 Please share Outsmarting the Bicycle Thief with your friends - bike gals and bike dudes alike! Vive La France! La France en 2018! Hope you all enjoyed the World Cup this time around. Win or lose, it's always good times to watch some world class footie. My team was eliminated in the Quarter Finals, by Germany no less, so I don't feel too bad. We watched the match surrounded by all the Frenchies at Belden Place, the tiny Financial District alley which is home to SF's French Quarter. Germany has an incredible team and, I'll admit - it was cool to witness Thomas Müller's sick moves on the dance floor as he celebrated their ridiculous win over Brazil. Hope y'all had a great time watching all those hotties on the pitch, like I did! Bring on 2018! Et ALLEZ LES BLEUS! How much do I LOVE Portland? It's the only city that can proudly claim bragging rights to both the Unipiper AND the world's only Pedal Powered Talk Show! Not to mention Phil and his rad Metrofiets! So put them all into one cute and short video that also includes goats! Yes, GOATS! Can't go wrong with a man in a kilt on a uni. Especially one that blows flames. 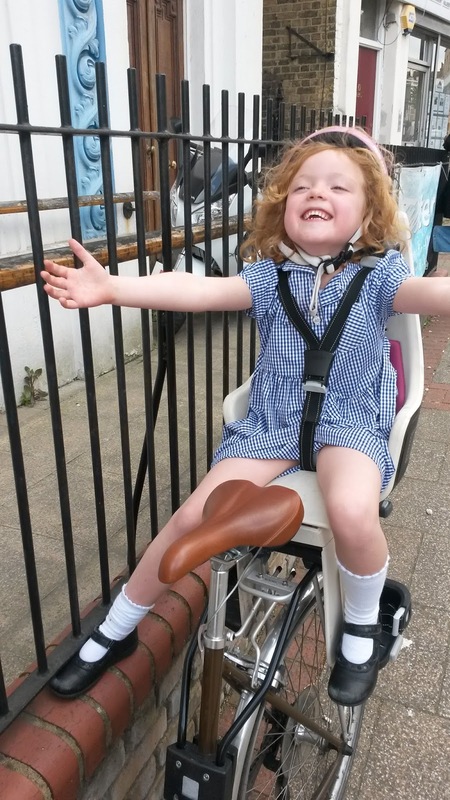 Raison d'etre: Promoting cycling as a desirable, accessible lifestyle choice. Favorite city to ride a bike in in the world: Has to be London but San Francisco comes a close second. Describe what you like best about your bike: It's light and streamlined and feels great to ride and it’s also easy to carry and store inside. It has a steel frame so is strong enough to take my 5 year-old daughter on the back and all our stuff in a basket on the front. It also has swept back handlebars which gives it both a traditional feel and more relaxed riding position. It’s the ideal bike for me at the moment – nippy but strong. Describe your personal style: Come summer I’m all about floaty floral dresses - they look and feel so good to cycle in. Spring and Autumn my Harris tweed riding jacket comes out teamed with skinny jeans and brogues for a more vintage look. Helmet or no helmet: Helmet. I don’t believe a helmet is a magic weapon against all injury but, personally, wearing one make me feel more confident when cycling amongst traffic. 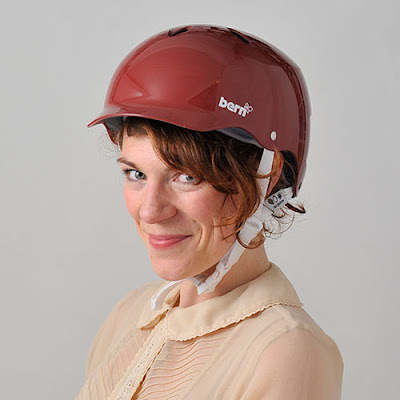 I always wear my trusty Bern Lenox in Cranberry - Bern helmets were the first product I ever sold when I started my business and we now have the Lenox helmet in Cranberry colour made exclusively for Cyclechic and it is our best-selling product! 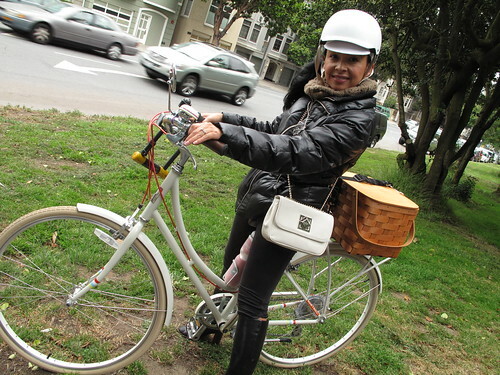 Favorite accessory when riding: Second to my helmet I would have to say my pannier. I am currently sporting a summery Basil Bloom Shopper. It either goes on my rack or in my basket and is great for both work and shopping. I also love my Michaux Lightening rucksack, made here in London by a local designer, Rachel Bonney – it’s so elegant. Favorite time and/or place to ride: First thing in the morning (after a cup of tea, of course) getting up and out on the bike is a great way to start the day and puts me in an optimistic frame of mind. My fave place has to be the backstreets of West London. 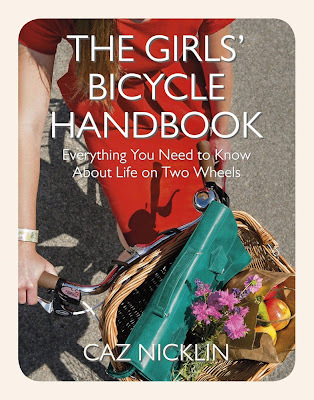 Tell me about your new book The Girl's Bicycle Handbook: The Girls Bicycle Handbook is a practical guide for women who want to incorporate cycling into their lives but have questions about how to do it? Advice ranges from; buying a bike, bike maintenance, road safety, accessories, cycling to work and of course cycling in style. The book also celebrates the cycling community with profiles on inspirational bloggers, businesswomen and wonderful female figures from cycling’s past. What inspired you to write the book? When I first came to cycling as an adult I had tonnes of enthusiasm but no experience so was hungry for advice and info. However most of the advice seemed either sport related or totally outdated and was more of a turn off than encouragement. I wanted to changes that and write a book that would was both pretty to look at but also packed full of useful, relevant advice to really help modern women start cycling and stay cycling. 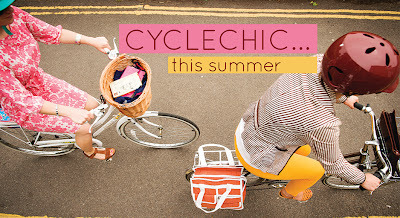 How does the book further your vision for Cyclechic.co.uk? 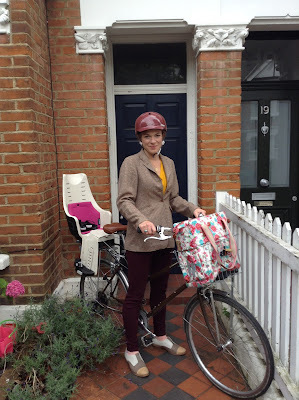 My vision for Cyclechic - both the shop and the blog - is to promote cycling as a desirable lifestyle choice to encourage more women to take to two wheels so the book is perfect extension of this mantra. I hope the book will invite women into cycling and give them advice that will make their life by bike easier and more fulfilling. Vélo Vogue tip of the day: Go for loose fitting dresses that come to around the knee when the hot weather kicks in. They are the comfiest and coolest cycling attire as they let the air circulate and you will look fabulously feminine as you cycle by. Fun image posted today on ESPN Brasil from Renata Falzoni.